Exciting News! Follow Me on Twitter For Robert Verdi's Holiday Twitter Event at Luxe Lab Thursday Night! | Fashion. Style. Beauty. | Life is short. Live well. Exciting News! Follow Me on Twitter For Robert Verdi's Holiday Twitter Event at Luxe Lab Thursday Night! I think it’s pretty easy to guess with all my coverage that I love me some Robert Verdi. He’s given tons of great advice to you, my fabulous FSB readers and tomorrow night (that would be Thursday, December 17th at 6:45 pm ET SHARP) I’m going back to the Luxe Lab to get the scoop on the celebrity stylist/jewelry designer/interior designer/media gadfly’s picks for holiday gifts! 1) You’ll have an opportunity to ask Robert questions and have them answered live on Twitter. 2) Robert is really generous and does giveaways to those who follow these tweets during events and I have it on good authority that tomorrow has some epic giveaways to followers from companies like Ugg and Vintage Shoe Company. Hello?!? Who’s going to turn down free swag from a celebrity stylist. Not I, said the cute little blogger. 3) Because it’ll be hilarious fun! Want to get a jump on the giveaways already? 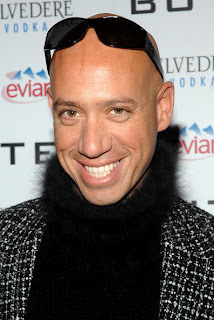 If you tweet ““I wanna win @robertverdi ‘s holiday shoe picks from Ugg Australia & Vintage Shoe Co! (insert your shoe size) #rvtips”, you’ll be entered to win some FREE SHOES, LADIES! 3) Grab a cocktail and follow hashtag #rvtips to get all the amazing news and scoop from inside the event. Trust me, his parties get really fun REALLY FAST, so expect some hilarious stuff to be flying around the Twittersphere. So follow me on Twitter and join me tomorrow at 6:45 pm ET SHARP for a Twitter party with Robert Verdi and a slew of other fashion and beauty bloggers to get the inside scoop from the mad style genius himself. See you tomorrow!